With more than 100 million Facebook fans, a museum dedicated to just him, and a blossoming career as a male model with his own line of clothing, there is no doubt that Portuguese soccer sensation Cristiano Ronaldo is known for more than just his skills on the pitch. 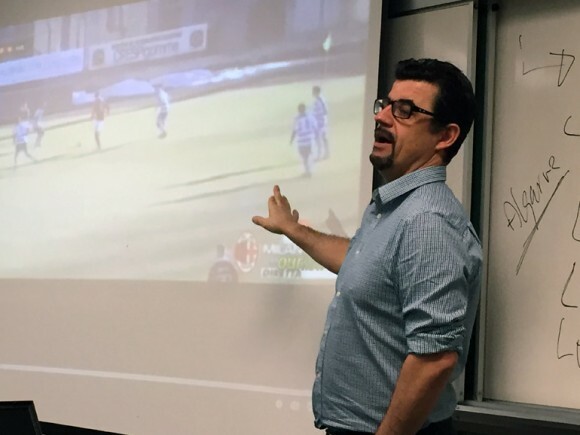 Luis LM Aguiar, associate professor of sociology in UBC Okanagan’s Irving K. Barber School of Arts and Sciences, is so intrigued by the superstar media attention Ronaldo receives that he is teaching a university course on the sociology of Ronaldo. But why should we care? And why should UBC Okanagan organize a for-credit, fourth-year sociology course on a fellow who plays football halfway around the world? Aguiar says Ronaldo’s appeal goes well beyond the soccer pitch; the fact that he’s on top of world with his career, and has social and cultural appeal to not only football fans, makes him an interesting study. It’s not a casebook study about the global popularity contest (which Ronaldo may be winning), says Aguiar. Students in his class will learn about the sociological relevance of social phenomena like organized sport and the forces that create a global athlete. Students will also learn about identity, nationality, and representation, and will discuss the phenomenon of Ronaldo across the Portuguese diaspora. Not every student in the class of 20 is a football fan. In fact Billie Franck, a fourth-year sociology student, admits the name was vaguely familiar, but she didn’t sign up to learn more about Ronaldo. She was intrigued by the ever-growing popularity of this 30-year-old footballer. With his own line of clothing, the world’s most recognizable athlete made Forbes Magazine’s richest celebrity list for 2014, has graced the cover of dozens of health and fashion magazines, has more than 31 million followers on Twitter, and even has his own downloadable app. Fourth-year student Landon Lacroix is interested in the ‘global citizenship’ of Ronaldo and is curious about how much impact one person can have culturally, spiritually, and financially on society. During the semester-long course, students will examine the stereotypical image of the Portuguese and discuss the Portuguese diaspora and Ronaldo’s place in it. While a passionate Portuguese, Ronaldo plays for rival Spanish club Real Madrid. 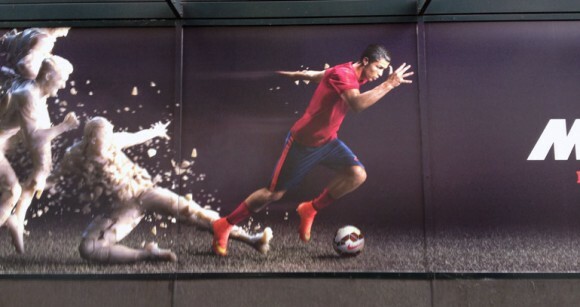 Ronaldo is everywhere. This photo was taken by UBC’s Luis LM Aguiar at a downtown Seattle mural.